Executive Function skills are the array of self-management skills that help us set and achieve goals. These cognitive skills mature over time and are often not fully developed until typical individuals are in their early to mid-twenties. What are some key Executive Function skills? Children need these skills in their everyday lives as well as in school. Adults need Executive Function skills to effectively manage their family lives and career demands. Weaknesses in one or more of these areas can lead to poor performance in school or at work, difficulties with peers and other relationships, and frustration stemming from repeated failures to achieve goals. There are a number of reasons children or adults can have weaknesses in Executive Functioning, including, but not limited to: ADHD, developmental delays, autism spectrum disorder, brain injury, mental health challenges, trauma, or other learning differences. The first step to addressing these difficulties is through proper assessment by a professional. Executive functioning can be measured by means of assessment by a psychologist using a comprehensive approach consisting of standardized tests, observations, self-report, parent and/or teacher checklists and interview/intake information. The good news is that Executive Function skills are teachable. In order to be effective, children and adults must be able to manage their emotions, focus attention, organize and plan their work and time, and reflect upon and revise their tactics as circumstances change. With expert guidance and structure, students and adults can learn to effectively manage themselves so that they are equipped for taking on challenges in school or in life. 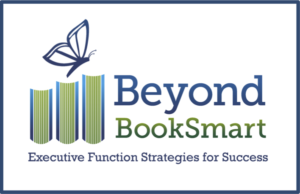 We have partnered with Beyond BookSmart, the recognized leader in Executive Function coaching, to provide services to our clients at our offices in Delray Beach. Find out more below about how Beyond BookSmart teaches skills that lead to a lifetime of confidence and success.